Gtk.Application encompasses many repetitive tasks that a modern application needs such as handling multiple instances, D-Bus activation, opening files, command line parsing, startup/shutdown, menu management, window management, and more. Gio.Action is a way to expose any single task your application or widget does by a name. These actions can be disabled/enabled at runtime and they can either be activated or have a state changed (if they contain state). The reason to use actions is to separate out the logic from the UI. For example this allows using a menubar on OSX and a gear menu on GNOME both simply referencing the name of an action. The main implementation of this you will be using is Gio.SimpleAction which will be showed off later. Many classes such as Gio.MenuItem and Gtk.ModelButton support properties to set an action name. These actions can be grouped together into a Gio.ActionGroup and when these groups are added to a widget with Gtk.Widget.insert_action_group() they will gain a prefix. 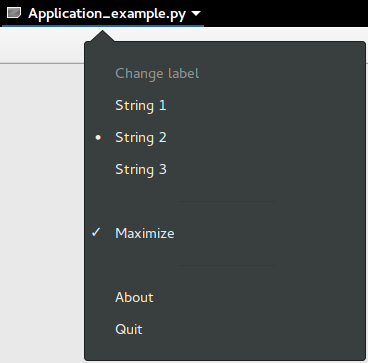 Such as “win” when added to a Gtk.ApplicationWindow. You will use the full action name when referencing it such as “app.about” but when you create the action it will just be “about” until added to the application. You can also very easily make keybindings for actions by setting the accel property in the Gio.Menu file or by using Gtk.Application.add_accelerator(). Your menus should be defined in XML using Gio.Menu and would reference the previously mentioned actions you defined. Gtk.Application allows you to set a menu either via Gtk.Application.set_app_menu() or Gtk.Application.set_menubar(). If you make use of Gio.Resource this can automatically use the correct menu based on platform, otherwise you can set them manually. A detailed example is shown below. When creating your application it takes a flag property of Gio.ApplicationFlags. Using this you can let it handle everything itself or have more custom behavior. You can use HANDLES_COMMAND_LINE to allow custom behavior in Gio.Application.do_command_line(). In combination with Gio.Application.add_main_option() to add custom options. Using HANDLES_OPEN will do the work of simply taking file arguments for you and let you handle it in Gio.Application.do_open(). If your application is already open these will all be sent to the existing instance unless you use NON_UNIQUE to allow multiple instances.